Goose Shoulder Stiffs are a classic fly tying material for dressing Salmon fly wings. Each pack contains two pairs of quality dyed goose shoulder. The fibres of these lovely feathers can also be used to create small bodies for buzzers and small nymphs. 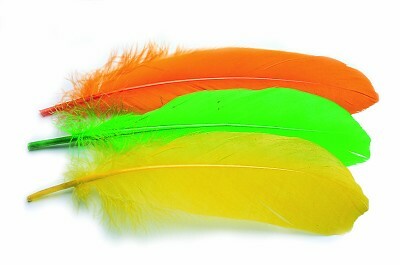 This particular feather is the Mallard in the Mallard and Claret. Mottled turkey wing quills are ideal for tying a wide range of flies from nymphs to classic salmon flies. French Partridge hackle feathers are the wonderful barred feather from just below the wing. Packets of selected genetic hackle feathers suitable for all your dry flies. This is a more affordable way than buying a full or half cape.